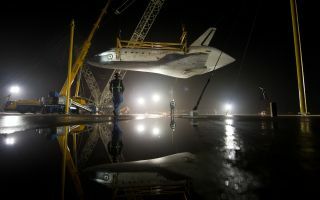 The space shuttle Discovery is suspended from a sling held by two cranes shortly after the NASA 747 Shuttle Carrier Aircraft (SCA) was pushed back from underneath at Washington Dulles International Airport. The space shuttle Discovery is suspended from a sling held by two cranes shortly after the NASA 747 Shuttle Carrier Aircraft (SCA) was pushed back from underneath at Washington Dulles International Airport in this amazing space wallpaper on Thursday, April 19, 2012, in Sterling, VA. Discovery, the first orbiter retired from NASA’s shuttle fleet, completed 39 missions, spent 365 days in space, orbited the Earth 5,830 times, and traveled 148,221,675 miles. NASA will transfer Discovery to the National Air and Space Museum to begin its new mission to commemorate past achievements in space and to educate and inspire future generations of explorers.